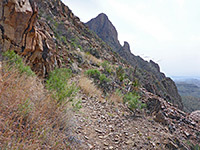 Trails in Big Bend National Park are many and varied, in length, difficulty and scenery. Paths lead to mountain peaks, up canyons, across the desert, to places along the Rio Grande, to rock formations and to historic sites, ranging from short nature trails less than half a mile long to cross-country hikes taking several days to complete. 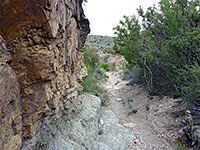 Most routes begin along the park's paved roads but a few need a 4WD vehicle to reach the trailhead - in particular those in the middle section of the Rio Grande, south of the Chisos Mountains. Some of the most popular trails are Boquillas Canyon, Dog Canyon, Lost Mine, Santa Elena Canyon and Window. 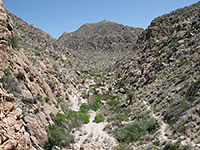 The Big Bend National Park Map shows the location of each trail - identified by the number. 1 Apache Canyon 3.8 230 The rarely traveled Apache Canyon Trail crosses undulating desert land of small ravines and ridges to an old corral, situated in the wide, upper end of a branched canyon once frequented by Apache Indians. A short, off-trail continuation hike reaches another drainage, lined by brightly-colored rocks. A disused but well preserved ranch building and a group of pointed red rock formations are the two attractions of the first 2 miles of the trail along Blue Creek Canyon, a route that continues upstream for several more miles, gaining height steadily, into the high country of the Chisos Mountains, where it meets the Laguna Meadows segment of the inner loop trail. 3 Burro Mesa Pouroff 0.5 50 This well used path to a narrow pouroff crosses sandy ground then follows a dry wash to the base of the cliffs; the drainage continues high above (reached by the separate Upper Burro Mesa Pouroff Trail). The lower path is accessed from a paved side road, forking off Ross Maxwell Scenic Drive. 4 Cattail Falls 1.5 360 A beautiful, hidden waterfall and an enchanting sequence of pools are the destinations of an easy, little-known trail on the west side of the Chisos Mountains, which crosses open slopes then enters an overgrown ravine. 5 Chimneys The Chimneys Trail heads west from a start point along the Ross Maxwell Scenic Drive, descending gradually over a vast desert plain beneath Kit Mountain, to a conspicuous volcanic dyke - the chimneys. After here the path stays on wide open desert land, close to a large dry wash and eventually reaches an old adobe cabin (Luna's Jacal), just off the gravel Maverick Road. 6 Dodson 11 1,200 Forming part of the Outer Mountain Loop, the Dodson Trail is a long cross-country route through the southern foothills of the Chisos Mountains. It begins in the west at Homer Wilson Ranch, near the Blue Creek Canyon trailhead, and leads across ridges, valleys, creeks and wide washes, meeting the Juniper Canyon Trail after nearly 11 miles. 7 Grapevine Hills 1.1 200 Seven miles along the unpaved Grapevine Hills Road, a short trail forks off southeast, ascending a sandy wash lined by large rounded boulders, some balanced quite precariously. The hike is considered a good choice for families with children. 8 Mesa de Anguila varies A loop and several spur trails cross particularly remote, hot and little visited terrain in the far west section of the national park, around steep-sided Mesa de Anguila, close to the Rio Grande. There are two trailheads - one just outside Lajitas, the other at the end of a rough track south of FM 170. 9 Mule Ears The Mule Ears Spring trail winds over typical Chihuahuan Desert land of small peaks, sandy flats and dry washes, to a cottonwood tree-lined oasis. Start point is Mule Ears Overlook, along the Ross Maxwell Scenic Drive 8 miles north of Castolon. Past the spring, the trail continues to a junction with a backpacking route linking the Chisos Mountains with the River Road. 10 Santa Elena Canyon 0.8 40 Santa Elena is most spectacular canyon in the national park, formed as the Rio Grande cuts through the 1,200 foot cliffs of Sierra Ponce. 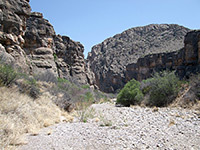 The mouth of the canyon is reached by a popular trail that crosses the lower end of Terlingua Creek (wading may be necessary), climbs up and over a rocky outcrop and ends on a sandbank next to the river; beyond here the water covers all the canyon floor, but the river is often shallow enough to allow continuation hikes upstream. 11 Tuff Canyon 0.2 level There are many box canyons in Big Bend - shallow but sheer-walled ravines, cutting across the desert plains. 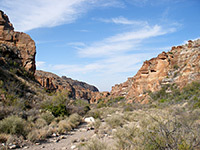 Tuff Canyon is a good example, located right next to the Ross Maxwell Scenic Drive and viewable by a very short trail. 12 Upper Burro Mesa Pouroff 1.8 200 The increasingly narrow and rocky ravine formed by Javelina Wash provides a course for a primitive but relatively easy trail that ends at the top of a 100 foot dryfall, at the edge of Burro Mesa. The foot of the pouroff is reached by a separate, shorter path; both begin along the Ross Maxwell Scenic Drive. 13 Ward Spring 1.6 450 This lightly used path leads to a small spring in the western foothills of the Chisos Mountains, located in a fairly narrow, overgrown ravine. A little way further upstream the ravine is crossed by a prominent dyke, and the drainage can be followed past here, over a saddle and on to a junction with the Blue Creek Canyon Trail. 14 Boquillas Canyon 0.7 40 The entrance to Boquillas Canyon, one of the three great river gorges within Big Bend National Park, can be reached by a short trail that climbs over a ridge then passes through a riparian area close to the Rio Grande, ending at a pebbly beach. At times of low water it is possible to continue some distance downstream, by a combination of walking along sand banks and wading in the river. 15 Chihuahuan Desert 0.5 (loop) level Many kinds of cacti and other Chihuahuan Desert plants can be seen on this nature loop trail, beside Hwy 118 at the Dugout Wells picnic area, 6 miles east of Panther Junction. 16 Hot Springs 3.0 250 The Hot Springs alongside the Rio Grande can be reached either by a gravel track (not for RVs), leaving Hwy 118 a few miles from Rio Grande Village, or by a pleasant 3 mile trail, crossing desert land with many and varied cacti, and frequent views of the river gorge (Hot Springs Canyon). The trail starts a little way west of the village, at the end of the spur road to Daniels Ranch. 17 Marufo Vega 14 (loop) 1,000 Perhaps the most difficult day hike in Big Bend, the Marufo Vega loop trail crosses hostile, mountainous terrain, exceedingly hot and dry during the summer months, and descends steeply down a canyon to the banks of the Rio Grande, deep within Boquillas Canyon. The route follows the river bank for a mile then returns via an equally steep climb up an adjacent ravine. 18 Marsical Canyon Unlike the other two major gorges along the Rio Grande, the trail to Marsical Canyon climbs high above the river, to an overlook at the edge of the sheer cliffs that enclose the river 1,200 feet below. Start point is at the end of Talley Road, which in turn is reached from the River Road, a total of at least 30 miles along rough tracks - 4WD vehicles recommended. After the viewpoint the path continues across remote country to an alternative trailhead at the end of Solis Road. 19 Ore Terminal 4.0 960 Ruins of the northern terminus of a six mile ore tramway provide an unusual destination for a fairly strenuous hike across ridges and dry washes, in low desert country west of Boquillas Canyon. Some of the path runs alongside iron cables and wooden trestles from the tramway, which once crossed the Rio Grande to a mine in Mexico. The trailhead is shared with the Marufo Vega loop, along the side road east of Rio Grande Village. 20 Rio Grande Village 0.4 40 Starting at the Rio Grande Village campground, this nature trail crosses a small wetland area (good for bird watching) on a boardwalk then climbs to a summit for views over the Rio Grande into Mexico. 21 Telephone Canyon 14 1,800 Competing with the Mesa de Anguila Trail to be the roughest and most remote hiking route in the Bend area, the Telephone Canyon Trail begins along Old Ore Road (HCV required) and heads eastwards to the park boundary, initially across several narrow ridges and then, after a steep descent, all along Telephone Canyon, a long and deep drainage through the Sierra Del Carmen mountains. 22 Boot Canyon 1.5 400 The path along upper Boot Canyon begins at the end of the Boot Spring Trail, on the south side of the Chisos Mountains, and forms part of the shortest route to the South Rim from Chisos Basin. It climbs slowly up the winding, forested ravine then passes over a narrow ridge to one of the most spectacular views in the park. 23 Boot Spring 1.3 160 This path forms a southerly continuation of the Pinnacles Trail from Chisos Basin, descending gradually into the upper reaches of Boot Canyon, past the spring, to a junction with the Boot Canyon Trail. Another intersection is with the Colima Trail, part of the Inner Mountain Loop. 24 Colima 1.0 350 The Colima Trail is a one mile connecting path between the Boot Canyon, Boot Spring and Laguna Meadow trails, running up and down a forested saddle just south of 7,825 foot Emory Peak. 25 Devil's Den 3.5 300 A primitive, cairned trail forks south off the well-used route to Dog Canyon after about 1 mile, following dry washes to the Devil's Den - a narrow slot-like canyon through limestone cliffs, where upstream progress requires scrambling over small dryfalls and other obstacles. 26 Dog Canyon 2.0 40 Dog Canyon is a short but narrow and steep-walled limestone gorge cutting through the Santiago Mountains, near the northern park entrance at Persimmon Gap. The easy trail to the mouth of the canyon crosses desert flats filled with many species of cacti. 27 Emory Peak 1 900 The trail to the summit of Emory Peak, the highest point in the national park, climbs steadily up a mostly forested ridge, ending with a short scramble up a near-vertical cliff. The path is reached by the 3.5 mile Pinnacles Trail, making the round trip to the summit about 9 miles (2,450 foot elevation gain). 28 Juniper Canyon 6.2 3,100 The Juniper Canyon Trail has the greatest elevation gain of any hike in the park - over 3,000 feet, from the desert flats in the upper end of the canyon (reached by a 12 mile drive over dirt roads), to the cool, wooded surroundings of Boot Canyon, in the southern Chisos Mountains. Most of the climb is in the last 3 miles - the first section is along the wide, cactus-covered canyon, where the ground slopes quite gently. 29 Laguna Meadow 4.1 1,700 Offering a longer but less steep alternative to the Pinnacles Trail for accessing the high Chisos Mountains, the Laguna Meadow route climbs steadily from Chisos Basin alongside a streamway, up to a plateau on the west side of Emory Peak, site of the meadow and several primitive campsites. It meets the Blue Creek Canyon Trail, climbs another 250 feet and terminates at a junction with the Colima Trail. 30 Lost Mine 2.4 1,200 From a pull-out along the Chisos Basin Road near Panther Pass, this often busy trail climbs a tree-covered hillside and a bushy ravine to a high, narrow ridge separating the upper ends of Juniper Canyon and Pine Canyon, providing an excellent introduction to the scenery of the Chisos Mountains. 31 Oak Spring 2.3 950 This path connects the Window Trail in the Chisos Mountains with Oak Spring Road (and the route to Cattail Falls) to the west, offering good views of the hills and the desert lowlands. 32 Pine Canyon 2.0 800 On the east side of the Chisos Mountains, Pine Canyon is a deep, shady ravine ending at a high dryfall, filled with tall trees of several different species. The path up the canyon begins at the end of a 6.4 mile primitive road that generally requires a 4WD vehicle. 33 Pinnacles 3.5 1,600 The Pinnacles Trail provides one of the two routes southwards from Chisos Basin into the high country of the Chisos Mountains. It starts by crossing the south side of the basin - bushy, sloping ground with somewhat limited views - then climbs steeply to a plateau between Emory Peak and Toll Mountain. From here the Boot Spring Trail continues further south while the Emory Peak Trail branches off westwards. 34 Rim 5.0 (loop) 450 The South Rim of the Chisos Mountains is a dramatic escarpment, beyond which the ground drops precipitously by over 2,000 feet, giving fantastic views over the desert beyond, to the Rio Grande valley and Mexico. The closest viewpoint is 5.8 miles from Chisos Basin (via the Pinnacles, Boot Spring and Boot Canyon trails), from where the Rim Trail forks off east and west, looping around the edge of the plateau with only minor elevation changes. There are ten primitive camping sites en route. 35 Window 2.2 560 The Window Trail follows a streamway westwards (downstream), starting at the Chisos Basin campground and ending at the brink of a 220 foot dryfall, at the edge of mountains. The route becomes increasingly overgrown, and as the Window approaches the canyon is lined with oak trees and riparian vegetation. 36 Window View 0.2 level This very short path takes visitors to a viewpoint of the Window, the oft-photographed, V-shaped gap in the mountains that encircle all sides of Chisos Basin.